The late Wilfred Thesiger's travels in the Arabian Rub al Khali or 'Empty Quarter' are well known, but the Sahara too has its barren regions. In the east is the Libyan Desert, while the less well known Majabat al Koubra ('Great Solutude' or 'Emptiness') explored by Monod in the 1930s spreads across the Mauritania-Mali borders. These hyper-arid, million-square kilometre expanses within the greater Sahara are barely touched by human presence; they represent the essence of the place known to the Arabs as al sahra: the desert. 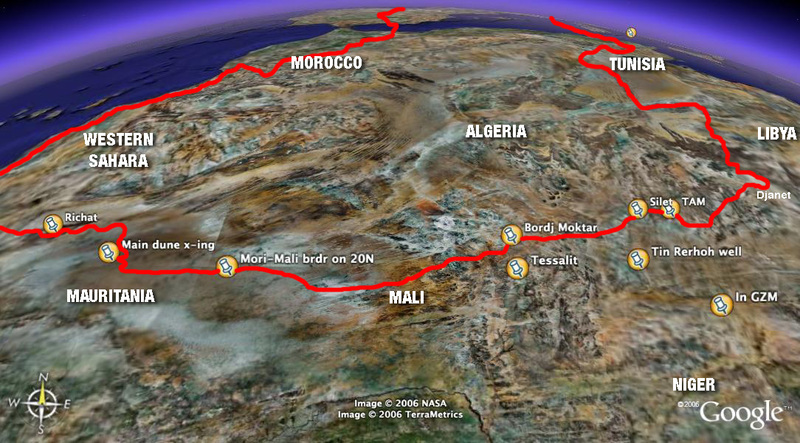 In November 2006 our 2000-km crossing from Atar in northern Mauritania, across the Ouarane Sand Sea and the bandit lands of northern Mali to Bordj Moktar in southern Algeria (click this or map left) - was a highly ambitious project which cost me my vehicle. In the end, by taking several liberties with border regulations and with a good measure of luck, we got within a day's walk of the Libyan frontier, having crossed over half the width of the Sahara. During our crossing we collected dust samples and imagery for Oxford University's Climate Research Lab. Dust from the Empty Quarter (red areas, right) is thought to have an important effect on the global climate, but has never been obtained or analysed before. 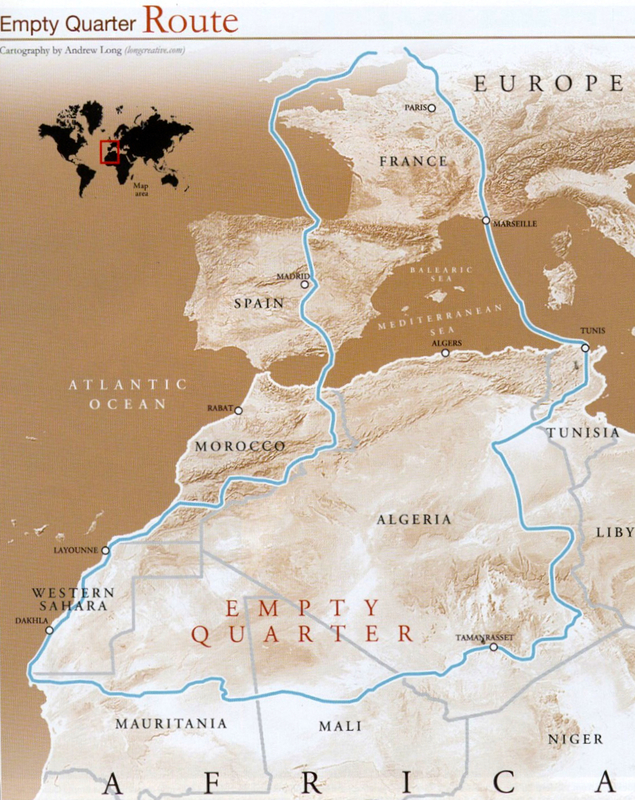 • Movie clips from the Empty Quarter. • A two-part account of the SEQ Expedition appeared in the Summer and Fall 2008 issues of Overland Journal and is now online. • An expedition report (hardcopy) is available to read at the Royal Geographical Society, London.